Another year, another Mankato team in the national rankings, and for good reason. They swept now #8 Boston University , stole a game at #16 North Dakota (and came within a goal of tying for the Saturday game), swept instate rivals #10 Minnesota. In addition to these ranked wins, they’ve also handedly swept Alaska & Ferris, but split last weekend against Bemidji. Leading the team in scoring are a pair of juniors and a sophomore: Parker Tuomie, Marc Michaelis and Jared Spooner. The three combine for 48 points. The netminders are a whole ‘nother animal, having the duo of senior Mathias Israelsson and freshman Dryden McKay split time. Israelsson has won all 8 games he has appeared in, whereas McKay is 3-2-0 in five appearances. 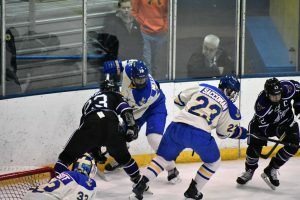 After splitting with Upper Peninsula rivals Northern Michigan University, may people, myself included, did not think the Lakers would remain in the rankings, despite the loss being sealed with an open net. The loss also marked the fourth straight Saturday that the Lakers have lost on. Gage Torrel, Ashton Calder & Brendan McKay each had a multi-point weekend, with defenseman Steven Ruggiero scoring the lone goal Saturday night. Minnesota-State has been the Lakers kryptonite since the nWCHA started, having won all but a single regular season game, having won 5-1 in the 2016-2017 series, and won game 2 of 2015-2016’s WCHA playoffs. As always, show up to support your Lakers at the Taffy Abel Arena this weekend. Puck drops at 7:07pm. Those of you that are out of town can listen to the game with Bill Crawford and John Forest on 99.5 YESFM, at yesfm.net or on TuneIn.